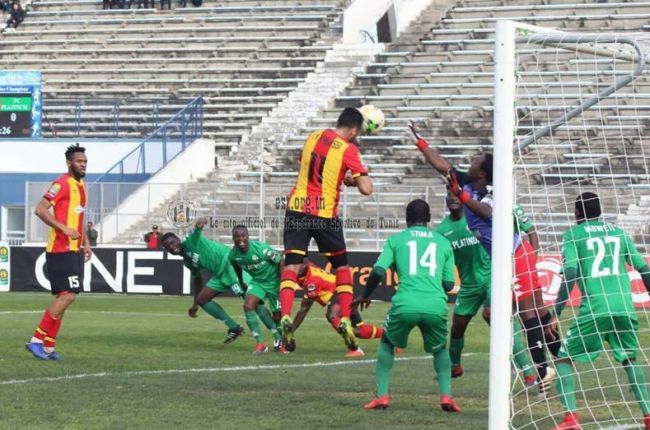 Tunisia’s Esperance Tunis earned their first win in Group B in the CAF Champions League with a 2-0 win over Zimbabwe’s FC Platinum at the Stade Olympique d'El Menzah on Friday night. The result combined with Esperance’s 1-1 draw against Horoya last weekend sees them on four points from two matches while Platinum are bottom of the group with one point following their goalless draw against Orlando Pirates last week. The Tunisian side controlled the flow of play from the opening whistle and made their dominance count with the game’s opening goal in the 24th minute courtesy of a strike from Taha Yassine Khenissi, 1-0. The away side tried to find their way back into the match before the break but were unable to do so and entered the tunnel trailing by a goal. Esperance came out strong in the second half and doubled their lead just after the hour mark thanks to a second goal from Khenissi, 2-0. The Tunisian side sat on their lead after that and cruised to a comfortable win. Esperance are next in action in the Champions League against Orlando Pirates on Saturday, 2 February while Platinum are at home to Horoya. Esperance: Jeridi, Derbali, Dhaouadi, Chammam (Ali Yacoubi 83’), Ben Mohamed, Coulibaly (Chaalali 66’), Kom, Belaili, Badri, Khenissi (Jouini 73’), Elhouni. Platinum: Mhari, Mhlanga (Muduvima 90’), Bello, Stima, Moyo, Chafa, Madzongwe, Madhanaga, Mbweti, Dube, Pavari (Eonde 70’).